Please Note: The screen shots accompanying this review come from the DVD portion of White Christmas: Diamond Anniversary Edition. 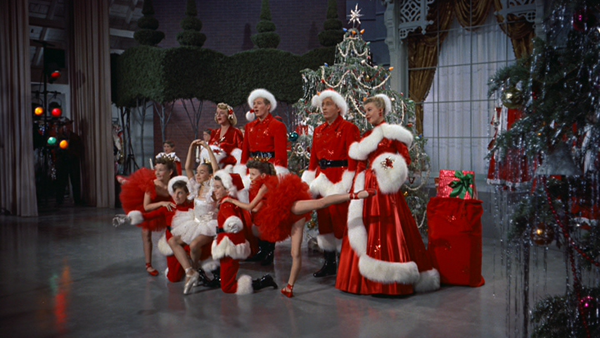 With Bing Crosby crooning Irving Berlin songs in proto-psychedelic Technicolor, White Christmas is the cinematic equivalent of a holiday fruitcake stuffed with nuts and marischino cherries dyed in festive red and green. The biggest box office smasheroonie of 1954, this glitzy musical has seemingly never left the yuletide moviegoers' collective consciousness. Paramount's multi-format Diamond Anniversary Edition puts a little gloss and tinsel on a chestnut that already got an expanded reissue for its 50th anniversary a decade ago. Affordably priced for gifting the kitschy holiday movie freak in your family (everyone has one, right? ), it includes the movie and copious extras in both Blu Ray and DVD (good for the auntie who hasn't yet upgraded her home video format), while an added CD of tunes sung by Crosby and co-stars Danny Kaye and Rosemary Clooney ought to keep the holidays "merry and bright." In a way, White Christmas is the reaffirmation of Bing's "White Christmas," the song which inadvertently transformed 20th century popular music. Before Bing, recorded Christmas music was an afterthought. After Bing, it became essential for every Pop singer of his generation to record a holiday album. It's a tradition that continues in the annual wall-to-wall onslaught of holiday music endured today - we all have Bing to thank (or curse) for that. As early as this film's 1954 release, "White Christmas" was inexorably linked to Crosby's image. Irving Berlin wrote it for Crosby to perform in the 1942 musical Holiday Inn, its nostalgic coziness thus striking a chord with a wartime audience. With Crosby back as a World War II veteran wanting to honor his magnanimous commanding officer, White Christmas might have fallen into the trap of cynically, lamely trying to recreate past glories. 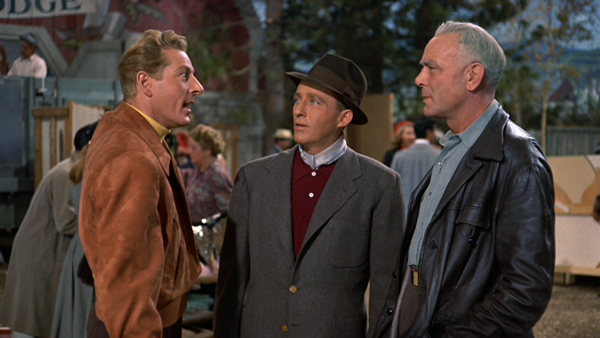 The final film is kept lively and fun, however, thanks to the professional direction of Michael Curtiz, a bevy of imaginatively staged numbers (Berlin returned to write the other songs, although none is as memorable as the title tune), and solid help from a surprisingly non-obnoxious Danny Kaye as Crosby's best pal and the proactive partner in their characters' song-and-dance duo. Despite its artificiality and the nagging sense that the two romantic couplings lack believability, White Christmas glides along on Crosby and Kaye's cheery camaraderie. Although it's easy to picture Crosby as a smug, disinterested performer, he's actually charming and brings a lot of feeling to the two renditions of "White Christmas" as the script demanded. He also seems enlivened by the relatively subdued, delightful Kaye, while Clooney's intelligent acting makes them a good match despite the age gap. This is also a pretty generous movie when it comes to giving each of the performers their own snazzy, impressively staged musical number. 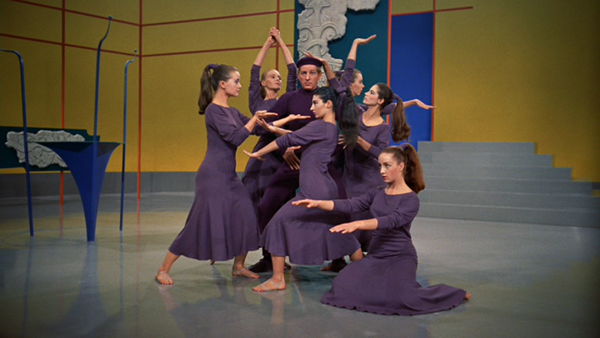 In addition to Bing's solemn "White Christmas" and the sophisticated "Sisters" (performed by the women, then by the guys in drag), Clooney gets her own torch number "Love, You Didn't Do Right By Me," Vera-Ellen dances around maniacally in "Mandy," while Kaye amusingly sends up Martha Graham in "Choreography." While most fans of this movie fondly recall the gaudy finale - with barn doors opening onto a gloriously fake, snowy landscape - there's a lot of other elements to White Christmas that make it a holiday staple. Even if the thought of egg nog and yule logs makes you want to puke, give this flick a try. White Christmas has already been released on Blu Ray in 2012; Paramount's Diamond Anniversary Edition expands on the earlier edition with several additional special features and a 12-song music CD housed in a separate paper sleeve. The package includes the film and extras on one Blu Ray and two DVDs. A note on the back also mentions that Paramount has donated $100,000 to Danny Kaye's favorite charity, UNICEF, on the occasion of the movie's 60th anniversary. 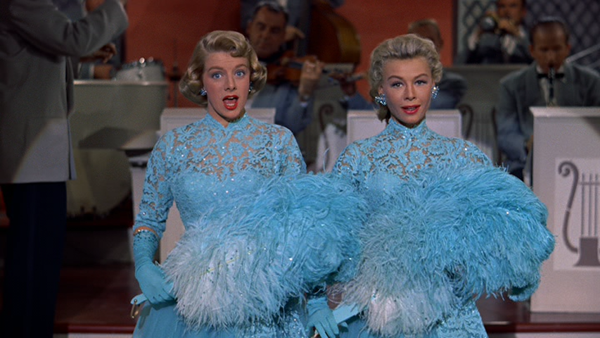 The Diamond Anniversary Edition of White Christmas uses the same transfer as the earlier Blu Ray, a crystal clear, scrubbled-up image which highlights the eye-popping Technicolor photography. The first film made in Paramount's VistaVision widescreen format gets translated to disc in a ravishing 1080p 16:9 image which preserves the film's grainy texture while upgrading the image fidelity. Details pop, blacks look rich and luxurious, skin tones are lifelike, and the wild color palette has a startling, extremely potent (yet never overwhelming) vividness. The soundtrack is available in both restored mono and an adequate 5.1 DTS-HD Master Audio mix. On the latter, the mix brings out the dialogue and adds to the top and bottom registers of the musical numbers, giving it a somewhat fuller sound. Since the stereo is a composite made from mono source material, however, the limitations show. Dubbed-in mono soundtracks are also provided in French, Spanish and Portuguese, while subtitles are included in English, English SDH, French, Spanish and Portuguese. 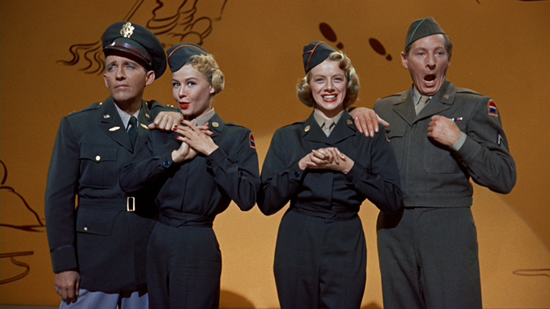 The Blu Ray edition offers a Sing-Along Mode with lyrics on thirteen musical numbers. The lyric-enhanced scenes are also individually accessible on a special menu. Five performances from filmed shorts and television specials comprise Classic Holiday Moments. These include Crosby's "White Christmas" from 1976 and 2012 (in a virtual duet with Canadian crooner Michael Bublé) and Danny Kaye performing a jazzy-arranged "Jingle Bells" with Nat King Cole in 1963. Bublé introduces Paramount's 1954 color short Assignment Children, with Kaye traveling to India, Japan, Korea and Thailand as UNICEF's official Goodwill Ambassador. In addition to supplying food and care to children, UNICEF's activities back then included spraying DDT to cut down on malaria-carrying mosquitoes. Photo Galleries with shots of rehearsals, behind-the-scenes, filming and publicity on White Christmas. Finally, there's the 12-track audio CD Bing, Danny, Rosemary & Friends: The Sounds of Christmas, various vintage tracks with the stars alone or in duets with Ella Fitzgerald, Peggy Lee and Judy Garland. A feature-length Audio Commentary with Rosemary Clooney sharing warm reminiscences of making the film. White Christmas: A Look Back with Rosemary Clooney (17 min.) In standard definition. Trailers for the musical's original and re-release runs. Like the gaudy ornament that you just gotta hang on the tree every year, White Christmas returns to home video in a superfluous yet lovely Diamond Anniversary package. 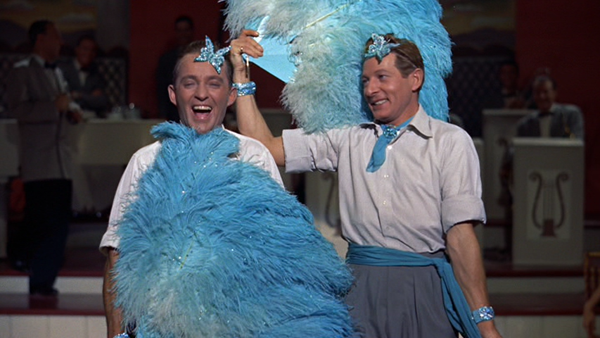 The smoothly made 1954 musical captures Bing Crosby at his laid-back, charismatic peak alongside vibrant co-stars Danny Kaye, Rosemary Clooney and Vera-Ellen. When discounted to well under $20, it's an excellent deal bursting with holiday cheer. Recommended.